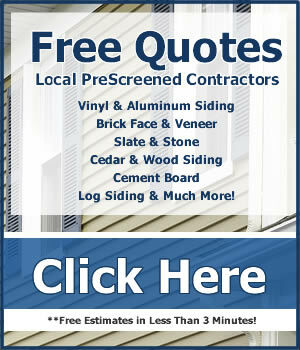 Siding cleaning methods are more alike than different. A pressure washer can be used on all types of siding. What differs is the precautions that need to be taken for each material. The detergent solution should not be allowed to dry before it is rinsed, so only one side of the home should be wet before rinsing. Since direct sunlight will quickly dry the cleaning solution, the workflow should be arranged to avoid it. When this isn’t possible, a sunny side of the house should be cleaned in sections 15-30 feet wide to prevent drying. Remove all non-permanent decorations, like Christmas or holiday decorations. If you have wood or cedar siding, make sure you seal all holes and cracks to prevent water leaking into walls. These siding cleaning tips apply to specific siding materials. 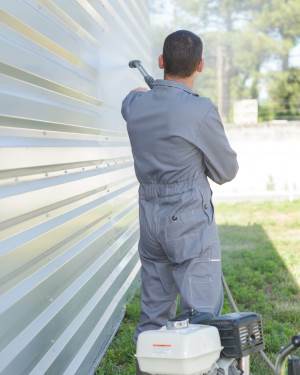 Vinyl and aluminum siding cleaning: Horizontal siding should be pressure washed side to side; vertical siding such as board & batten siding should be washed up and down. For either, the essential precaution is not to force water into the seams of the siding where it can cause mold or warp the home’s sheathing. Brick, brick veneer, stone and slate: Inspect and replace missing or loose mortar around brick or stone at least a week prior to cleaning to give the mortar time to cure. Also, make sure weep holes aren’t clogged, so that any water that gets behind veneer will be able to drain properly rather than becoming trapped against the home’s sheathing where it will cause mold and warping. All wood siding: Check and repair wood siding, shingles and shakes for missing or damaged material, and replace it before the siding is cleaned. Replace cracked sections or repair the crack with quality wood filler and allow it to dry. Never use a brush with stiff or wire bristles on wood. If you have any concerns, use the minimum pressure, typically 1,200 to 1,500 PSI, needed to remove the detergent solution or rinse with a garden hose. If you have reason to believe your wood siding is fragile, do not pressure wash it. Instead, use a soft brush to wash it with a mild soap solution, and rinse it with the garden hose with the sprayer you use to water the garden or wash your car. Painted wood siding: The US outlawed lead paint in 1978. If you suspect that your wood siding predates 1978, it might have layers of lead paint below the surface. Use minimal pressure to remove only the loose, top layer of paint. If several layers of paint are flaking off, contact professionals for advice and cleaning.